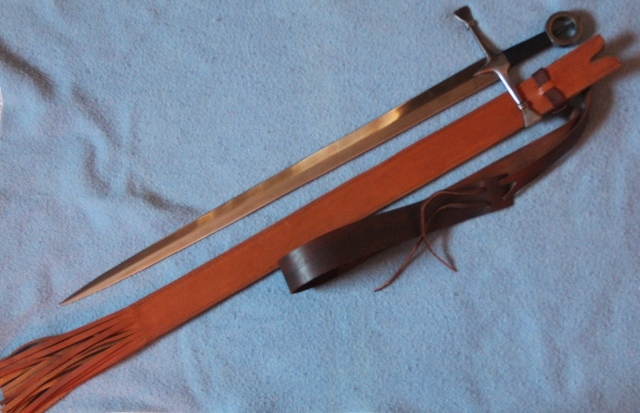 Brian at DBK just finished making a scabbard for my Albion Knight sword, and a matching sheath for my Albion dagger. The scabbard is based on the brass of Sir William de Fitzralph (AD 1323), Church of St John the Baptist, Pebmarsh, Essex, England. 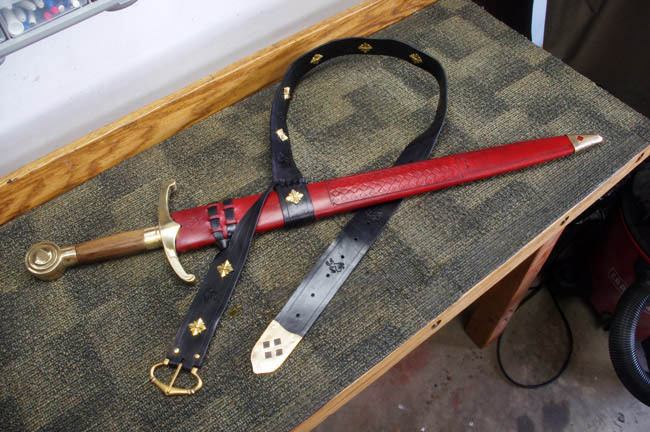 heres my scabbard that i made myself to fit my St George Armoury hand and a half sword. it has a wood core covered in red velvet and bronze fittings from Tods Stuff. i glued strips of leather to the wood before covering to give the scabbard some patterns in relief. hope you like it. I've posted some photos of this before but it never does any harm to showcase the work of a master, and a gentleman to do business with as well. 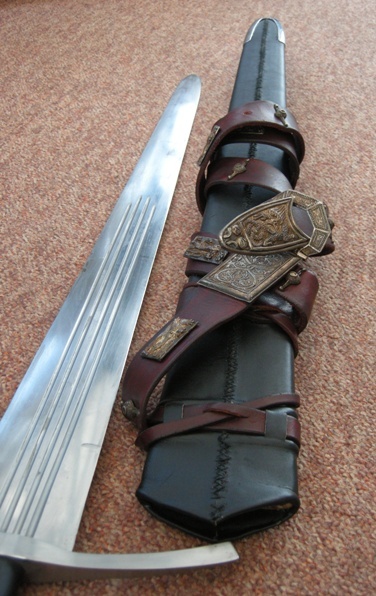 Peter's version of Ewart Oakeshott's favourite sword with scabbard and integral belt. The silver plated brass belt fittings are from Raymond's Quiet Press and look better for darkening down with patina. 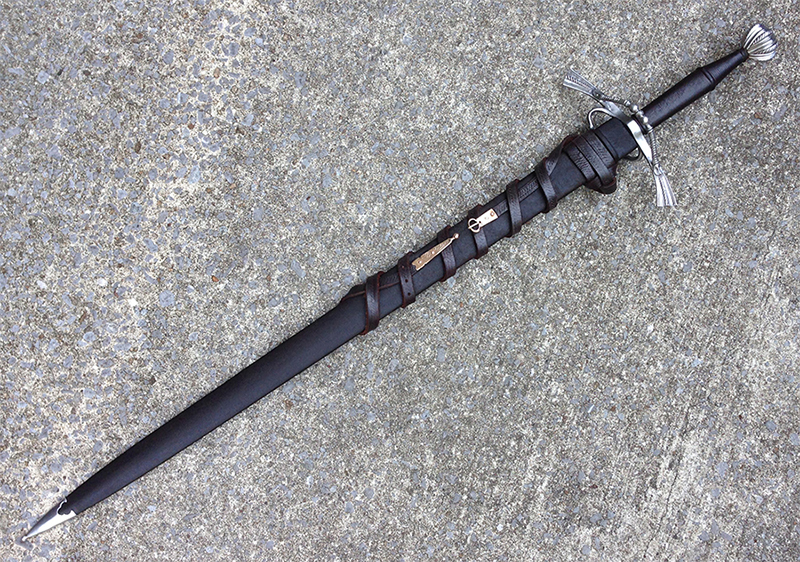 Pictures don't do the size of this sword justice. Jonathan Fletcher, that's incredible work. Really like the fittings from RQP! Harry, as always your DIY stuff is an inspiration and just really well researched. Some great additions. 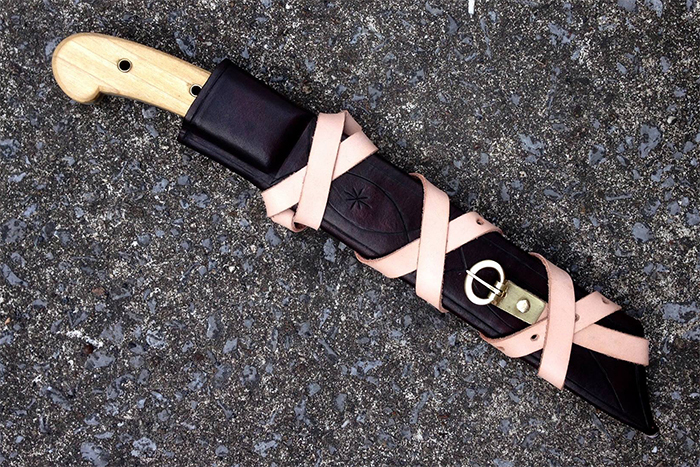 Here is one of my latest, a sheath from Arms and Armor to fit their Irish Ring-Hilt Sword. I got the sword a couple of years ago used here in the marketplace. 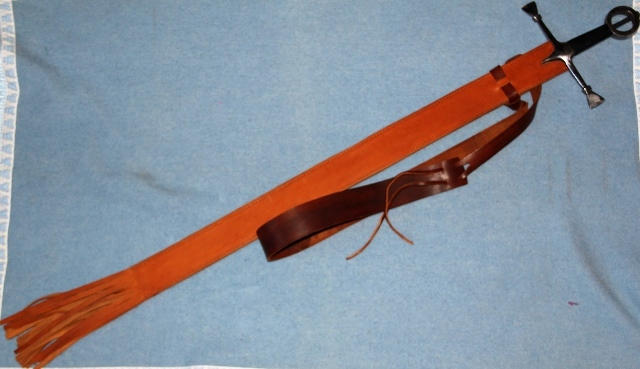 I wanted a basic, fringed, baldric sheath and thought they'd be able to do a fine job without me having to send the sword. Looks really nice, almost exactly what I wanted. I'd have liked maybe a more weathered or mottled look for the leather, but it is the color I asked for. 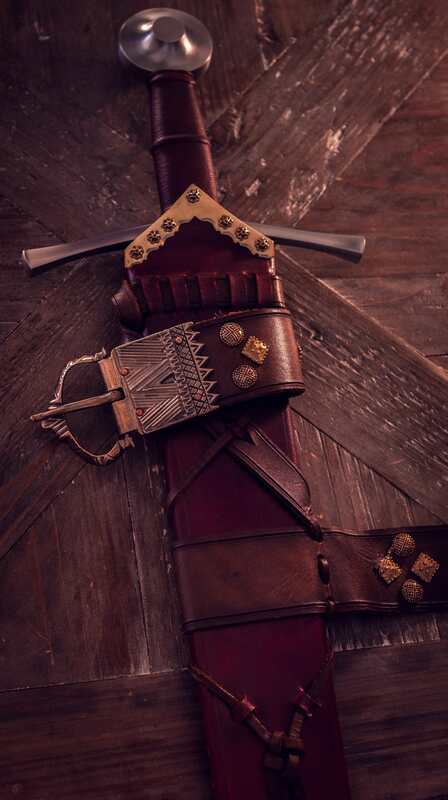 The baldric is a bit long, but can be adjusted. Now I should get the grip changed to match the sheath and polish the used sword (especially the hilt) so it looks as good as the sheath. And apologies for the baby blanket background. It was the closest quasi-neutral background at hand today. That's a fantastic presentation. Well done! 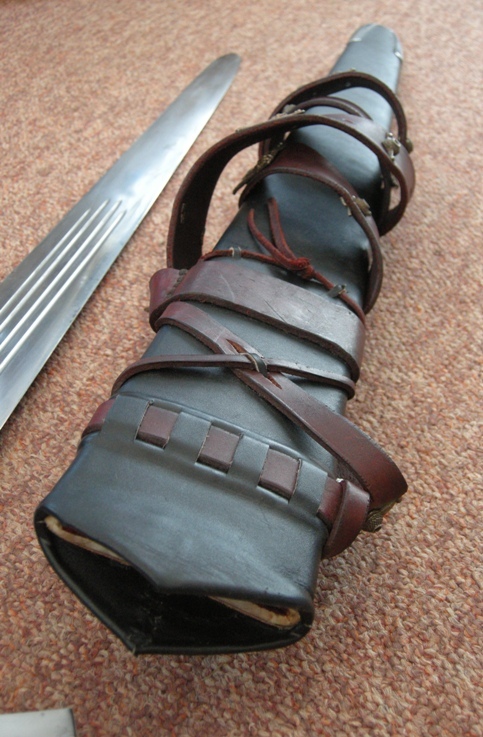 J. Nicolaysen's sword and scabbard made me think I should upload images of my similar , though much cruder, scabbard. 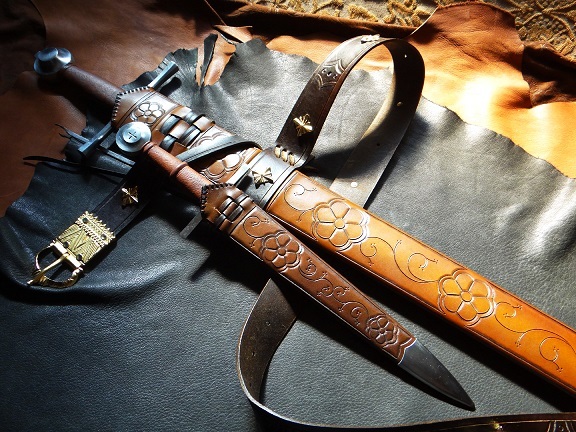 Please forgive the quality of both the leatherwork and photography, my artistic is not so much. It has been awhile since anything has been posted in this thread so I thought that I would kick it to the top with my latest. Brian at DBK has in my opinion has done a superb job with limited input from me. This is for my John Lundemo made Celtic blade. I basically told Brian to come up with something Celtic/Norse with a hint of the fantastic thrown in. I hope it is okay to link directly to Brian's site for this. Made a few more sword scabbards. The others were made with a 2-piece carved Poplar wood core. 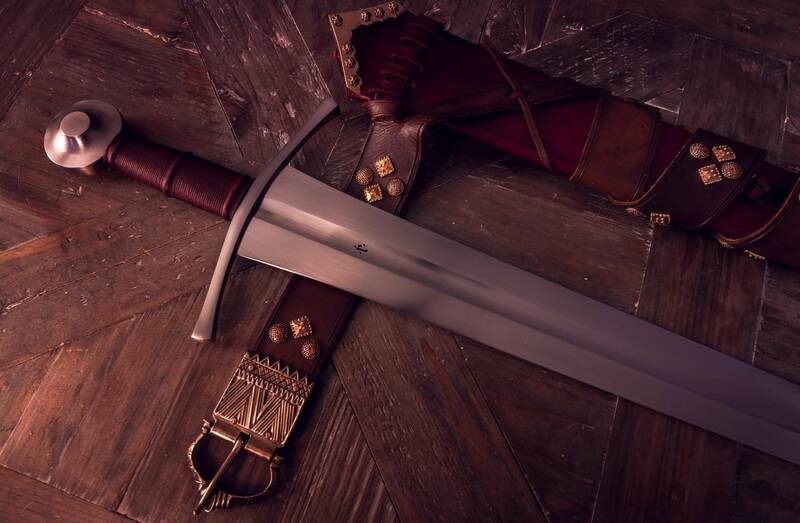 What are the details on the wood handled sword in the red scabbard? Who made it, etc. I don't see a lot of plain wood handles being made by today's sword makers. Under-represented maybe? 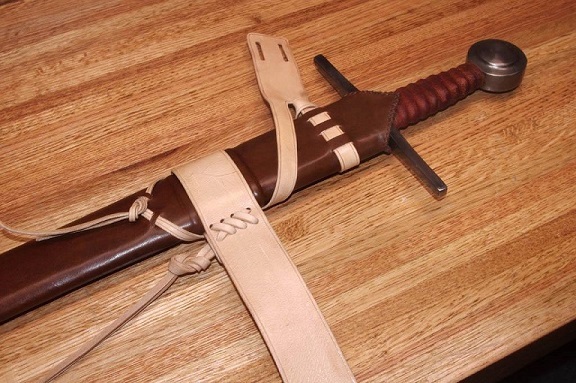 That's some cheap 10-pound sword, a friend asked me to make a scabbard for it. 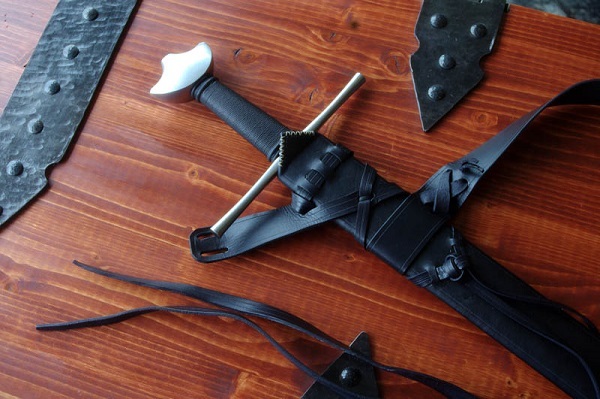 Probably Ren Faire material. Here's my latest from DBK... Great work as always! Here is one Tod recently did for my Albion Yeoman, his work speaks for itself.